The Lumineq® EL640.400-C3 FRA – Planar EL Series display is an Electroluminescent (EL) display that Capetronics has the capability to possibly refurbish, repair or replace with a brand new unit. If your glass substrate is damaged a replacement would be the only option at this time. The EL640.400–H series displays are rugged, high resolution electroluminescent (EL) flat panel displays. They feature an integrated DC/DC converter and their compact dimensions save space that can allow the addition of features or reduction in overall size. They are designed to work in extreme environments and the crisp display is viewable at wide viewing angles both in horizontal and vertical directions. Their ease of installation reduces system integration costs. The EL640.400–H is a 640 column by 400 row flat panel display with a 1:1 pixel aspect ratio. 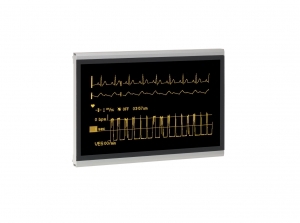 The digital flat panel interface is designed to match the needs of most systems. The displays may be driven at frame rates up to 75 Hz. 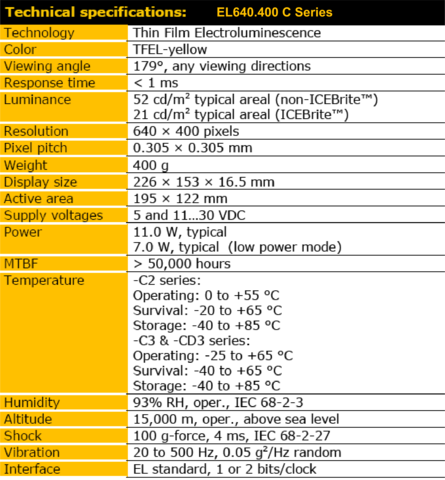 Specification sheet for the EL640.400 Series.